On behalf of UGC, the Central Board of Secondary Education announces holding of the National Eligibility Test (NET) on 22nd January 2017 for determining the eligibility of Indian nationals for the Eligibility for Assistant Professor only or Junior Research Fellowship & Eligibility for Assistant Professor Both in Indian Universities and Colleges. CBSE will conduct NET in 84 subjects at 90 selected NET Examination Cities spread across the country. The candidates who qualify for the award of Junior Research Fellowship are eligible to pursue research in the subject of their post-graduation or in a related subject and are also eligible for Assistant Professor. The universities, institutions, IITs and other national organizations may select the JRF awardees for whole time research work in accordance with the procedure prescribed by them. The award of JRF and Eligibility for Assistant Professor both OR Eligibility for Assistant Professor only will depend on the performance of the candidate in all three papers of NET. However, the candidates qualifying exclusively for Assistant Professor will not be considered for award of JRF. It is notified that CBSE will conduct the next UGC-NET for Junior Research Fellowship & Eligibility for Assistant Professor on 19th November, 2017 (Sunday). 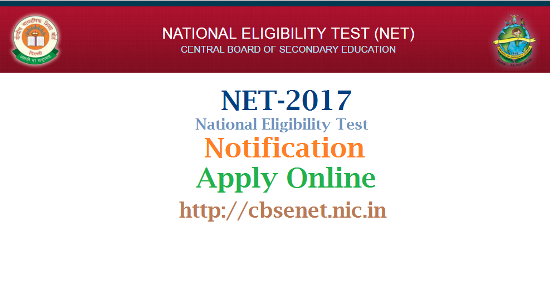 The candidates who desire to appear in the test may see the detailed notification available on the website http://cbsenet.nic.in from 24th July, 2017. The candidates are required to apply online from 01st August, 2017. The last date for applying online is 30th August, 2017 and fee can be paid up to 31st August, 2017. The role of CBSE is only upto the conduct of NET Examination and declaration of result. The e-certificates to qualified candidate are issued by UGC- NET Bureau. So the candidates declared qualified in NET are informed to contact Head, UGC NET Bureau, University of Delhi, South Campus, Benito Juarez Marg , New Delhi, Pin Code-110021, Phone No. (011-24116316, 24115416, 24115419) .